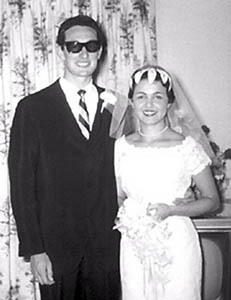 At the Chapel of Love: Buddy and Maria Elena Holly on their wedding day. 'A LOT OF PEOPLE don't believe in love at first sight," says Maria Elena Holly, widow of rock & roller Buddy Holly. "But in my case, it was so." Currently in its last two weekends at San Jose Stage, Buddy: The Buddy Holly Story is faithful to the real-life love story. Buddy stepped off the elevator into the office where Maria Elena was filling in as receptionist. After only brief chitchat, he asked her out. "I had never, ever in my entire life gone out with anybody," she remembers. Five hours into their first date, at a popular celebrity restaurant in New York: "He told me to wait a minute, and he disappeared. He came back; he had his hands behind his back, and then he sat down and had a red rose in his hands and said, 'Will you marry me?' And I said, 'You wanna get married now or after dinner?'" Maria Elena thought Buddy was just kidding and, jokingly, told him he would have to go through her aunt. Buddy showed up to see Maria Elena's aunt the next day. Both to hear her tell the story and to see it onstage, Maria Elena played it coy. She was witty, skeptical and certainly gave Buddy his hurdles to jump while her true sentiments remained inscrutable. "You know what?" she says, "I fell in love with that man the minute he came through those doors." Their two-week courtship saw enough happy accidents to make an agnostic believe in fate and soul mates. San Jose Stage Company's production captures this spark, although it doesn't show the full extent of Maria Elena's continued presence behind the scenes. "They don't show that I traveled with him a few times for tours," she says. "I was in charge of most of the things when we were on tour." Maria Elena remembers doing everything from laundry to equipment set-up to making sure the guys got paid, which was not always easy. "Sometimes we went, and the man who was in charge would not pay us." Holly's death devastated Maria Elena to the point where she could not listen to his music for many years. Thirty years later, when she first saw The Buddy Holly Story in London, she could not stay through the entire show. "And even at this point sometimes I choke up," she admits. Yet, she did return to the long-running London production, and on a yearly basis, sometimes joining the cast onstage for the finale to sing along with her husband's songs. "I decided I want to be there for him," Maria Elena says. And in this way, Buddy is still a part of her life. She has seen productions of the show throughout the United States and Europe, and she will be in the audience at San Jose Stage this weekend for the final two shows, will appear at a dinner, post-show party and fundraiser at the Agenda Restaurant on Saturday (Oct. 25) and a post-show discussion and reception on Sunday (Oct. 26). Of all the productions she's attended, her favorites are the ones in which audiences get up, sing along, and dance in the aisles. "Yes I miss him, I love him, but, hey," she says, "his music is here, and this is to enjoy."